Max Lee and Mezan Hesham produced the tie of the first round as Lee eventually came through 9-11, 11-3, 11-9, 8-11, 11-9 in 76 minutes. Hesham – a 20-year-old who is among several young Egyptians rising up in the squash world – recently described his game as “crazy, reckless and impatient”. And so it proved as, despite losing the match, he produced 31 winners to his opponent’s 20 – an array of boasts, drops and drives. His forehand particularly was very effective, earning 22 of those winners. His party piece, which he had reasonable success with, was shaping to hit drive and then at the last minute stopping his wrist for the disguised drop shot. The other side of this is that, aiming as he does mere millimetres above the tin and with his wrist contorting itself all over the place, his game is very prone to errors, of which he produced 26. Lee, meanwhile, hit just 10 errors (and 20 winners) – a vital difference at this level. Lee showcased his great all-round game and fantastic athleticism and his experience just shone through in the end as he won the fifth 11-9. The Hong Kong player was effusive in his praise for his opponent, and unduly modest about his fine performance. “He’s so accurate, he hit so many winners and he’s so quick. I credit him and I just won the game with a bit of luck today,” he said. Peter Barker also faced a talented young Egyptian in the form of Mohamed Abouelghar. The Essex player came through 11-7, 11-5, 11-8 thanks to a typically solid display of squash, with just seven errors over three attritional, let-filled games. He said: “He’s a talented boy. I felt like I didn’t hit many drops, it was quite a boring game, but if I opened the game up, he was just going to crucify me. “He’s got a really nice compact swing and he gets a lot of power from it and it’s hard to read. “So I was playing a little bit of a straight game and just feeling my way in and that will stand me in good stead for the rest of the tournament. “I’ve seen him play and he can go up and down, and tonight he played a very mature game. I expected more errors from him, albeit a few more winners. 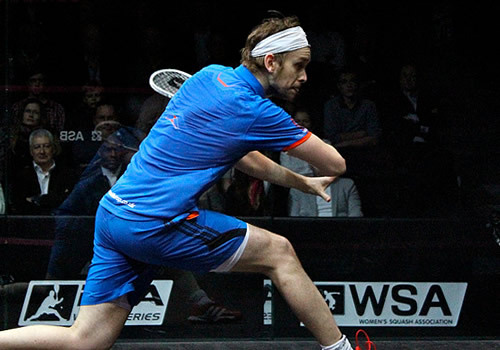 James Willstrop, four-time winner of the tournament, made a welcome return to Canary Wharf after fearing last summer that his runner-up performance last year could be his last East Wintergarden appearance. And he even enjoyed a bagel (eleven straight points to win the game), as he saw off another Egyptian, Omar Abdel Meguid, 11-0, 11-9, 11-7. “On the Saturday morning, after the final at Canary Wharf, the difficulties were slightly more pronounced than usual, but I still wasn’t thinking the problem would be significant enough to change the whole outlook of the next year of my life,” he said. “In June I took the call from a doctor who delivered the news that my career could well be over. The layer of cartilage in the hip had worn thin and was arthritic. It promises to be an enthralling encounter – the pace and power of the German “tree-chopper” up against Willstrop’s precise, patient game; it’s sometimes remarked that he plays squash like a game of chess.